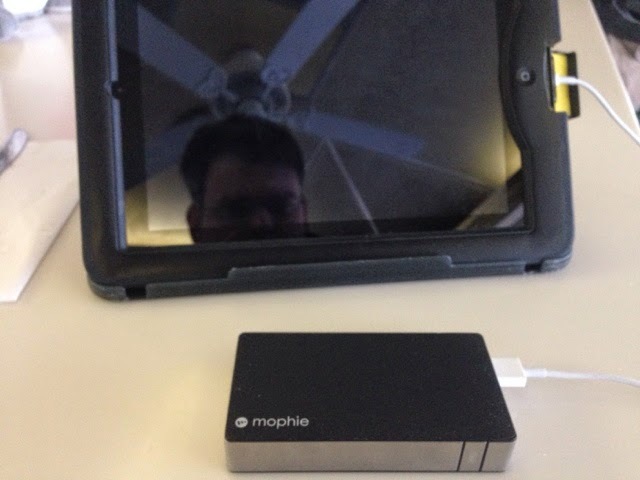 I've been using the Mophie Powerstation Duo since this summer. I actually bought it on the way to the 2013 Boy Scout Jamboree to replace the portable battery I'd forgotten to pack. Picked it up at a Best Buy for the MSRP of $100. It's a 6000mAh battery for USB-powered devices. If you know me, you know I'm addicted to my iPhone. The problem is that I use my phone so much, it's not uncommon to need a second full charge during the day to make my phone last all day. Since I use a LifeProof iPhone case, I can't use a case with built-in battery power. That means I'm stuck carrying a USB power supply with me almost all the time, because I hate having a dead phone. I like the Mophie battery. I've used it regularly over the last 9 months, and it still appears to hold a charge without issue. On average, I get 2 full charges of my iPhone, or a full charge of my iPad off of a fully-charged battery. That's while I'm using it, so it's by no means "perfect" conditions. The battery takes ~4 hours or so to charge completely from empty. The battery is small enough to fit in a coat pocket or my work trouser cargo pocket when I want to travel light, and it usually lives in my "satchel" that I carry to work with my iPad and various charging cables. It also appears well designed and durable. I've dropped the battery a couple of times and it's still working fine. If you're on GovX, the device can be had for a decent discount, but I also don't think the device wasn't worth what I paid for it. If you're looking for a portable battery for your digital devices, I think this is a good product.